Iwobi opened the scoring against the run of play when his deflected effort from Sead Kolasinac's cross was palmed into the corner of his net by Ben Hamer (16). Huddersfield controlled possession for large periods of the game but nothing would fall for them inside the Arsenal area, and instead Lacazette doubled the lead just before half-time when turning in Ainsley Maitland-Niles' low cross from close range (44). The spirited hosts, who had lost 11 of their last 12, never gave up and finally got their reward in the third minute of added time in the second half when Kolasinac turned Adama Diakhaby's shot into his own goal, but it was not enough to stop Arsenal pulling back within a point of fourth-placed Manchester United. Home Team: Hamer (6), Smith (6), Jorgensen (6), Schindler (7), Kongolo (4), Bacuna (6), Hogg (6), Mooy (7), Diakhaby (7), Kachunga (5), Puncheon (6). Subs: Durm (6), Depoitre (5), Grant (n/a). Away Team: Leno (7), Maitland-Niles (7), Mustafi (6), Koscielny (8), Monreal (6), Guendouzi (7), Torreira (6), Kolasinac (6), Mkhitaryan (8), Lacazette (7), Iwobi (6). Subs: Elneny (6), Suarez (6), Willock (n/a). Arsenal arrived looking to arrest a run of three away defeats in a row, but found Diakhaby's raw pace in behind Kolasinac tough to deal with early on. The familiar problem of a poor final ball still dogged the hosts however, and instead Arsenal went ahead with their first real chance when Kolasinac's excellent cross was met on the half-volley by Iwobi, but a deflection off Kongolo wrong-footed Hamer who could only push the ball inside the side netting. Huddersfield failed to register a shot on target before half-time but looked like having something to build on with the break approaching, until their hopes were dashed a minute before the interval when Maitland-Niles found space on the right with Kongolo out of position, and his low ball in left Lacazette an easy finish. After the break Huddersfield looked more dangerous but were close to getting caught out again as they committed men forward, with Iwobi denied by the onrushing Hamer and Christopher Schindler's excellent challenge stopping Lacazette from scoring his second. 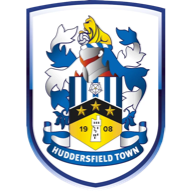 Huddersfield made four changes from the side thrashed at Chelsea, bringing in Jason Puncheon to join Adama Diakhaby and Elias Kachunga up front in a 4-3-3. 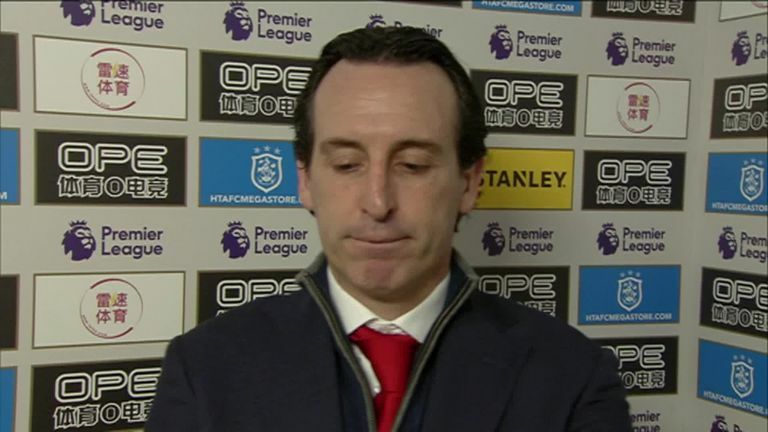 Illness ruled Mesut Ozil and Pierre-Emerick Aubameyang out of the Arsenal squad, and Ainsley Maitland-Niles and Alex Iwobi were their two changes. At the other end, Diakhaby forced smart saves from Bernd Leno with two efforts from the edge of the area and substitute Erik Durm's cross was deflected onto the bar. But just as the hosts looked to see their hard work and improvement on recent performances unrewarded, Leno failed to deal with another Diakhaby effort which bounced off him and goalwards, only for Kolasinac to poke it into his own goal under pressure from Laurent Depoitre. Arsenal are the only side without an away clean sheet in the Premier League this season. Sead Kolasinac's own goal was Huddersfield's first goal in 597 minutes of football in all competitions, since Steve Mounie scored against Burnley in January. Arsenal won their fifth away Premier League game of the season, one more than they managed on the road in the whole of 2017-18. Huddersfield are the first side to lose seven consecutive home Premier League games since Wolves in April 2012 (a run of nine). Alexandre Lacazette netted his first away goal in 10 games for Arsenal in all competitions, since scoring twice at Fulham back in October. Alex Iwobi has a hand in 10 goals in all competitions for Arsenal this season (4 goals, 6 assists), his best return in a single campaign for the Gunners. Jan Siewert: "We showed everyone we wanted to give a big fight and we did, until the end of the season I will fight for my life and the supporters to stay in the Premier League. 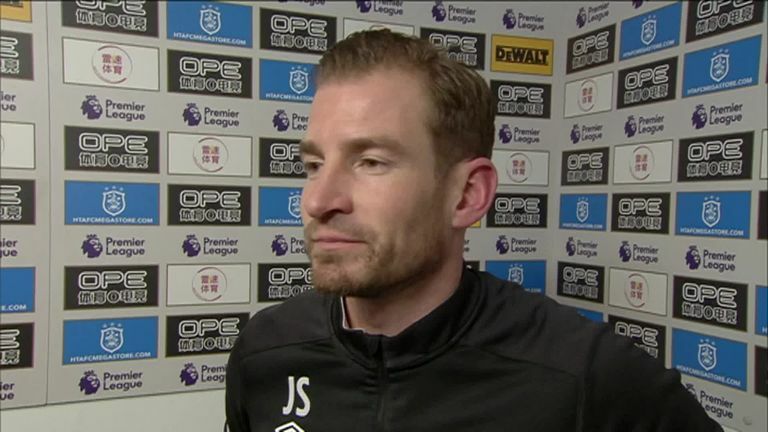 Huddersfield boss Jan Siewert was encouraged by the fighting spirit his players showed despite suffering a 2-1 defeat against Arsenal. "I said to the players to go out and win the second half, and we did. I could really see what we're working on, and I'm totally proud of how they played against a team like Arsenal." Unai Emery: "Their coach said yesterday they need to run a lot, and we spoke in the season that we need to show everybody we want these three points, and run like they are running and also more. 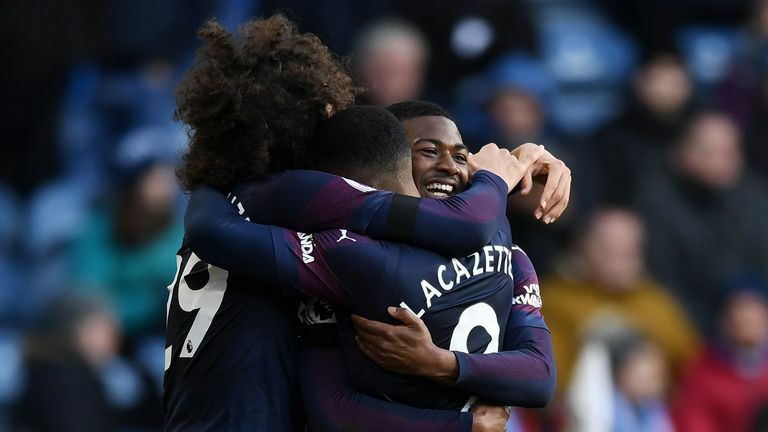 Unai Emery felt Arsenal controlled the majority of the game as they beat Huddersfield 2-1 in the Premier League. "It was a struggle for every minute of the 90, and I think we controlled the match but maybe I want more possession. It's a good result after a lot of matches not winning away." Neither side were particularly impressive in the final third but Koscielny won everything in his own area and denied Depoitre a certain goal after Leno had palmed a Diakhaby shot into his path after half-time with a stunning sliding challenge. He made more blocks (two) and clearances (10) than anyone else on the pitch, enjoyed a better passing accuracy than any other starter (90.2 per cent) and made two crucial tackles to keep his side's clean sheet in tact until Kolasinac's bizarre last-minute own goal. 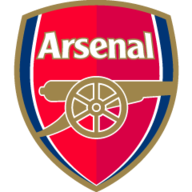 Huddersfield travel to fellow relegation strugglers Newcastle next Saturday at 3pm, while Arsenal's next game is a foray back into Europe, with an away trip to Belarusian side BATE in the last-32 of the Europa League on Thursday at 5.55pm.